When people ask me what I did this summer I am going to tell them, “I vacationed in Beaumont, Kansas.” That’s right! It’s truly an oasis of the Flint Hills—if that’s even possible considering the mass beauty of this delicate region. 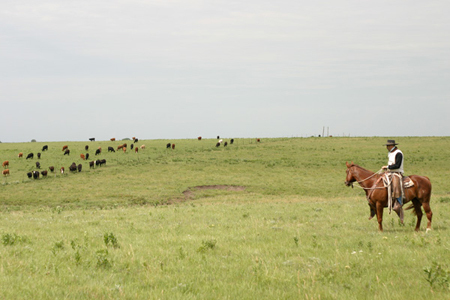 While other horseback-riding excursions exist in Kansas, there is none more hands on than Ride The Flint Hills. Proprietor and local ranch hand Mark Dahlsten brings his years of “cowboying” to fruition here in Beaumont; also a tiny community known for its historic hotel and fly-in café (not bad for a town of 50 or so). Having never been on a horse in my life, I felt it wise to bring a friend horseback riding—enter Tim. At least if it was a complete disaster I’d have a witness who could relay my humiliation to the rest of the world.We arrived in Beaumont (about 45 minutes east of Wichita) around 10 a.m., parked the car, met Mark and walked to the horse pens. Meanwhile small propeller planes were landing and taking off along the main street and the town was a buzz; it was as if we were in the middle of nowhere, but we weren’t. Quickly Mark introduces us to our horse companions for the day: Doc and Rooster. Mark begins by helping us both by attaching a stampede string to our freshly bought hats (found at Shepler’s the night before); for only a novice would believe their hat would stay put while trotting across the prairie. Heed Mark’s advice on attire as well: sunscreen, fitted jeans, cowboy boots and a light jacket were essential; details he will set you up with before arriving. We were given a lesson in each horse’s ability, quirks and behavior. Turns out horses, much like children, will act up when they know they are under the watch of anyone but mom or dad. Rooster, in particular, enjoys leisurely stops to chew on grass then realizes he’s behind the rest of the pack and will gallop to catch up. The sweat beads of nervousness were beginning to form, but I think I hid them well. Given expert direction I was able to hop in the saddle on my second try and we were off! We took a slow-paced trot through the first prairie, surrounded by trees and a herd of cattle. Off in the distance a deer jotted across the landscape, a scene I knew was normal for the area, but at that enchanting moment I felt truly lucky to be riding through the iconic Flint Hills and the reins became second nature. We grazed so close to herds of cattle the city slicker in me faded. We felt the cool breeze of the prairie and traversed through various grasses of the land. We rode at our own pace and along our own path, no nose to tail here. It was as if someone had to pinch me to wake me up from this outstanding experience. Making a loop around Squier Ranch and Ferrell Ranch I realized I was encountering a life I thought only existed in the movies. How magical to live and work on ranches in the Flint Hills, which is truly part of this particular horseback riding experience—it’s an open book to a world we know exists, but we rarely experience. Once back at the pens we caught our breath and stretched our legs before helping Mark take the horses back to the pasture. Treats in hand and saddles put away, we walked the beautiful creatures a short way to their companions. Once there, all six horses crowded around, gentle as can be, nudging for a treat.I am sure I was grinning from ear to ear. While I was sad the adventure had ended, my hips and legs couldn’t have taken much more; two hours for a beginner was just right. Ride The Flint Hills caters to varying experience levels and offers many packages ranging from a couple hours to season passes. And fortunately for us, Mark accompanies every group except maybe the highly experienced. To conclude the adventure we stopped in the café at the Beaumont Hotel for some lunch—an appetite was duly worked up. This petite café is reminiscent of a Valentine Diner where pictures of planes and pilots drench the walls. As we enjoyed a beer, club sandwiches and hand-cut French fries, we watched planes take off down the main street runway, yet one more surreal experience for our visit to Beaumont. Whether you make a day or a weekend out of this truly unique adventure, you’ll want to go. You haven’t seen Kansas until you ride the Flint Hills with Mark Dahlsten and his trusty steeds.